Homeopathy was discovered by Dr. Samuel Hahnemann–a German Physician in 1790. During one of his experiments he noticed that after ingesting the juice of bark of China (Cinchona officinalis) he developed malarial symptoms (chills, fever, nausea), whereas Cinchona drug was actually used to treat malaria. Thus a new system of medicine evolved called Homeopathy based on principle “Similia Similibus Curantur” which means ‘Likes cure likes’. That is, a drug that produces certain set of symptoms in a healthy individual can cure the same in a diseased individual. In his experiments, Dr. Hahnemann developed a method of “potentizing” homeopathic remedies by diluting them in a water–alcohol solution and then vigorously shaking (or succussing) the mixtures. The results convinced him that a high degree of dilution not only minimizes the side effects of the remedies but also simultaneously enhances their medicinal powers. Homeopathy is derived from Greek words “Homoeos” = Like or Similar, and “Pathos” = disease or suffering, which means ‘Likes cure Likes’. 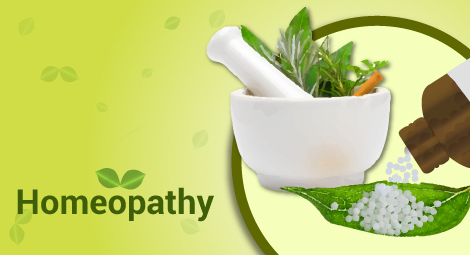 The efficacy of Homeopathy drugs is well established in almost all the ailments including those which are a challenge to the modern medicine such as Rheumatoid Arthritis, Cancer (Malignancies of various origins), Diabetes Mellitus.etc. Most importantly since homeopathic medicines are in dilutions the side–effects are grossly minimized. Hence this system is perfect in ailments of infants and children. The effects or the medicinal values of the drugs are determined by Drug Proving. The homeopathic drugs are derived from various sources. A good remedy removes the disease from its roots and leaves no trace of the disease behind. Individuality (Constitutions) is given prime importance in Homeopathy because no two individuals are alike. Hence we have one drug per individual and this path thus becomes unique and more accurate. Case–taking is the most vital part prior to treatment wherein the mental symptoms along with the physical symptoms are analyzed by the doctors. There is a concept of Vital force and Miasms which determine the health status and his future health condition which are again unique to the principle of this path. After 200 years, Homeopathy has made tremendous advance with pioneers such as Dr. James Tyler Kent, Dr. Boeninghausen, Dr. Boericke, making voluminous contributions and enhancing the spread of this branch world over. Today Homeopathy is recognized and practiced in over 30 countries around the world. It is recognized Internationally as a branch of Complementary and Alternative medicine.